This raven keeps a benign eye on all he surveys. He is part of a series of bird portraits - torso only. 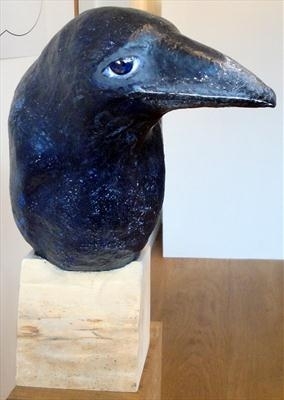 The raven is part of a series of bird portraits using torso only, getting to the essence of each bird's unique personality. This raven is friend to man, and has the look of a guardian angel. He doesn't exude the usual corvid haughtiness. 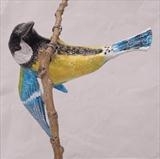 He is on a small wooden plinth from Moss & Co, timber merchants.